most time ever spent in one kitchen! Sadly, there was just no time to post anything this week :( From last Sunday, to today, Jody and I worked 132 hours each. 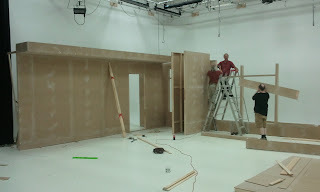 Our contract guys didn't work nearly as much, but they did put in long hours pre-building all the set walls. We loaded up all the bits and pieces Thursday morning at 7 am, and didn't get home until 2:30. Then we did it all again on Friday. This really put a wrench into my Turbo town schedule, so Jody and I worked 15 hrs on Saturday, and then worked 30 hours straight thru until today. I'm pretty wiped! 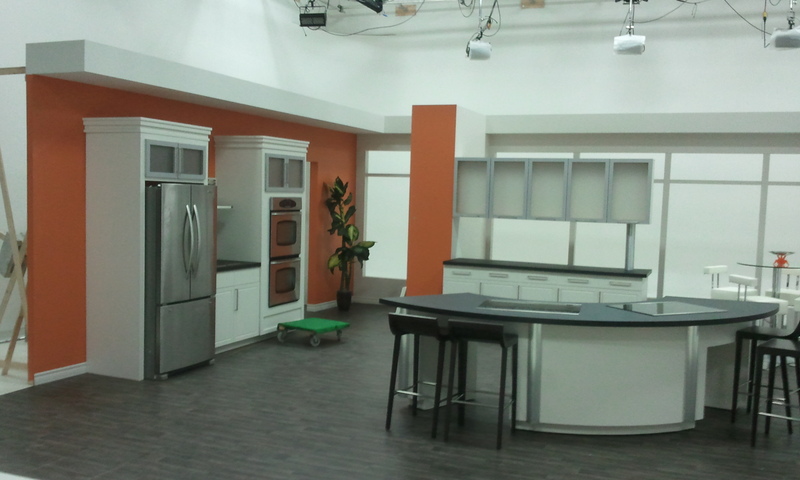 The studio the kitchen set was in is a fairly new studio and was a little hard to find at first. Decent size, but not like any set I've been on before. It was pretty sterile. I'm used to paint flying and plaster slopping around. Jody tackled all the cabinet painting. None of the pieces were shipped painted, to avoid damage. I didn't get the laminate installed on all the counters at the shop, so I had to do it at the studio while she was painting. As big as the space was, it did get a little crowded for a bit. Thankfully pre-light wasn't until Saturday, so we didn't have the lighting guys hanging cable in the mix as well. The studio floor was as far from flat as you could get, which posed all kinds of problems with keeping things straight and level. But the three guys didn't even slow down a degree, they just kept going. They got a lot further than i thought they would, given the floor circumstances. The island I had built had 3 sections, divided by 4, brushed aluminum columns. 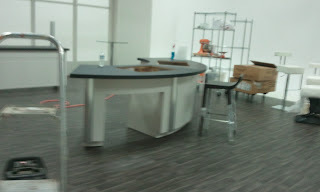 This was fairly large, the counter top that sits on it was 11 1/2 feet from tip to tip. The whole thing ended up being ridiculously heavy. Good thing I installed casters before it was all assembled! I had our Techno cut the dual stove top openings at the shop, so that save a ton of work on set. 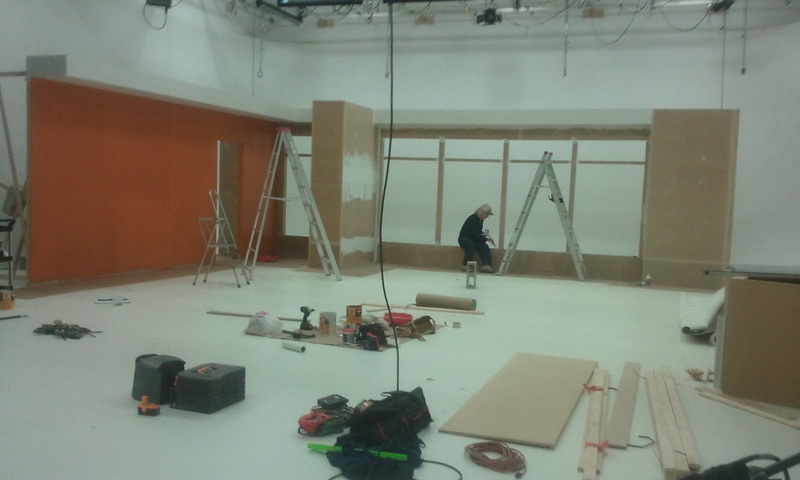 I like when set build days go as smooth as possible. Deanna Kubista was the buyer on this set, and did a great job picking the vinyl wood flooring we had to install. As heavy as it was, it made a great seamless covering that certainly added a lot to the whole feel of the kitchen. 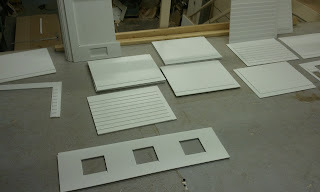 All of the cabinets were basically just frame panels with mdf doors we made, stapled on from the back. all the upper cabinet doors were done in a brushed metal laminate, adding to the very contemporary feel of it all. I got great joy in asking people I never met before to pass me a screw driver from one of the drawers. It's funny when they don't open! After 2 very long set days, it was done. It looked stellar! Very real. Mind you, the real appliances helped a lot with that, but you would think it was all real at first. t have to wait until the end of the day, with dry paint, to get the tiles installed. Now were back into Turbo Town again, I'm really quite happy overall that we got this job. A lot of work, but well worth the pics! For the ease of making my blog searchable, I've decided to do separate posts whenever possible on the current builds. We got the trailer for Dug the dumptruck done and painted, and sent back to the production company. Yaay, one down. 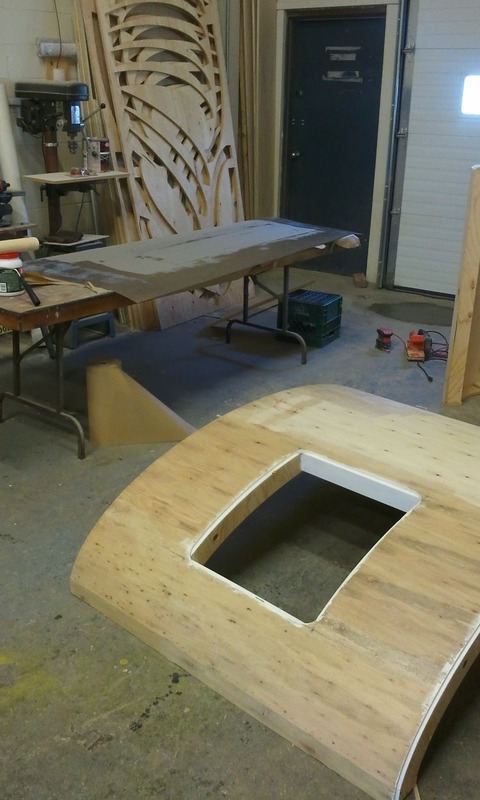 The script calls for multiple water dunkings with this one, so, like everything else we're fabricating, we made the deck from 2 layers of PVC.Jody scribed in the deck boards on it, and used a large nail set to put in rivet details that would "fasten" the boards down in real life. 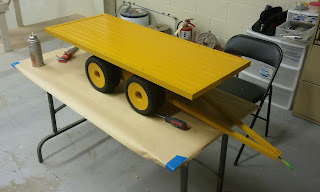 We have decided on "old caterpillar yellow' for all the construction vehicles. The rest of the boat-house got it's siding on. We are siding around the windows, this way, when the building is painted, we can just pop the finished windows in place. 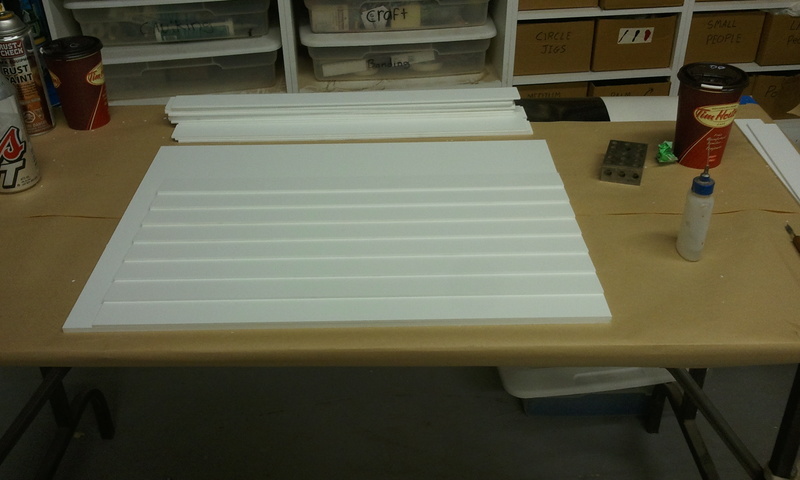 The window mullions and trim are staying white, so we won't be painting those. In fact, all the trim will be white. 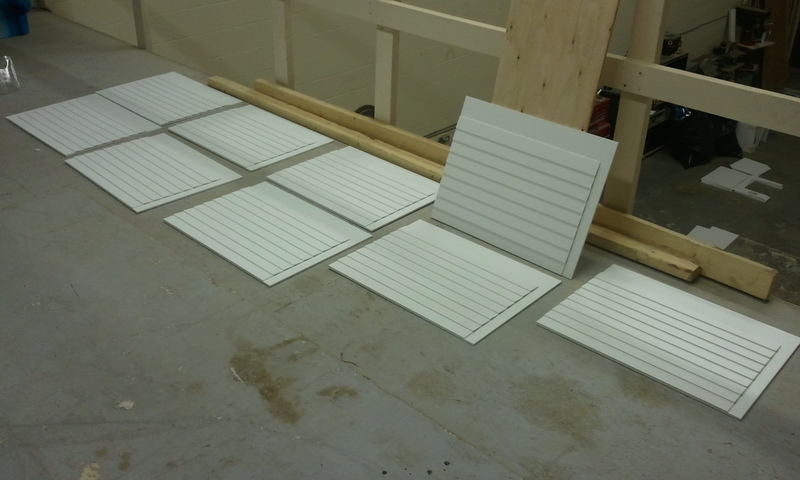 Last Thursday I got ALL the windows, mullions, and other odds and ends cut, so they're waiting for final gluing, then they're done! John and Jody manned the vaccum former today, we were able to pull all the race cars, so they just need trimming and cleanup. 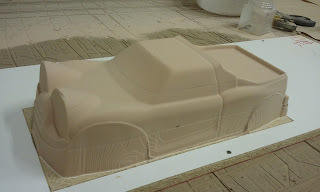 We did get a couple of pulls on my truck mold as well. 99% of it is awesome, but there is still a little cleanup to do on some seams before we go to finals on that one. The next few days we should be churning out tonnes of stuff. It seems to go that way on these kind of things, it feels like nothing is getting done, than BAM, finished parts come flying out of the shop! The last little while has seen us working on 2 large builds. 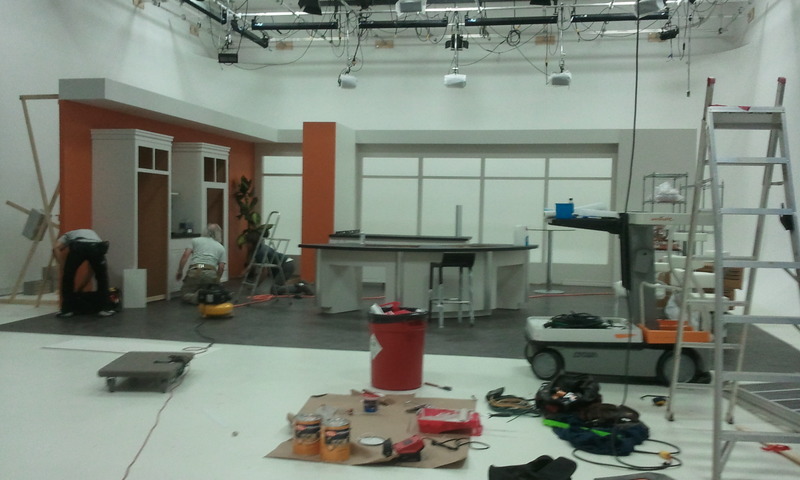 We are hard at work on the Turbo-Town model build, as well as a large kitchen set for a commercial. The set is 25'X25', so you get the idea. 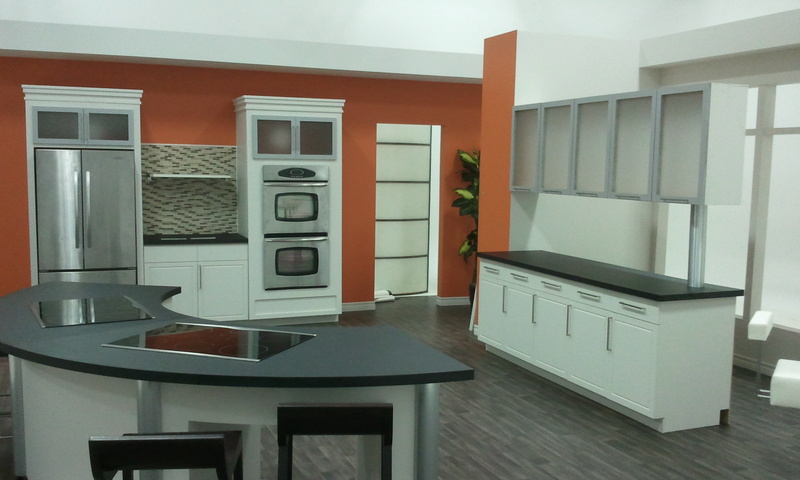 This kitchen will be fairly contemporary in it's style. The lower cabinets are a white colour, while the upper cabinets doors we're doing in a brushed aluminum laminate. 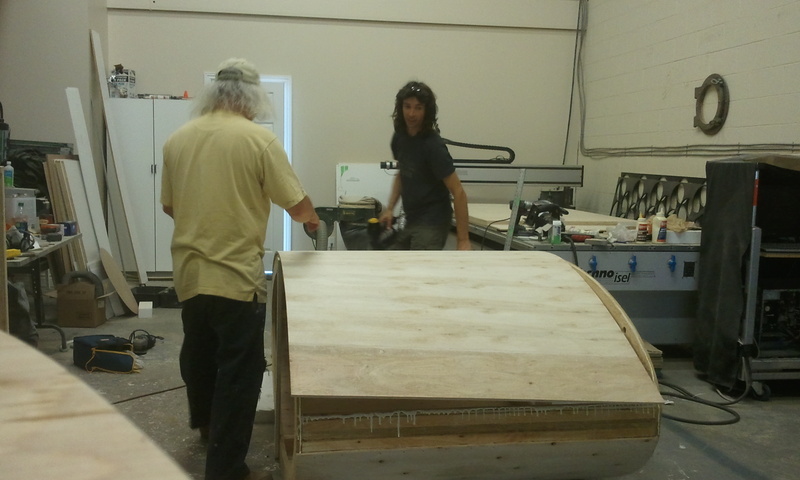 Roger and Andrew have been pounding out wall sections since last week, and were in again today (Sunday). Jody and I had our friends Rob and Deb from Indiana(Indiana Rob) stay with us for 2 days. I wished it could have been longer, but the 2 projects have immovable deadlines, so we said our goodbyes this morning :( Sandy Baird, from Windwalker signs also came up on Saturday, and spent the night as well. It was great for all of us to hang out again, even though it was only June when we were all together! As you can see, we are quickly starting to bulge the walls of the shop to accommodate things. 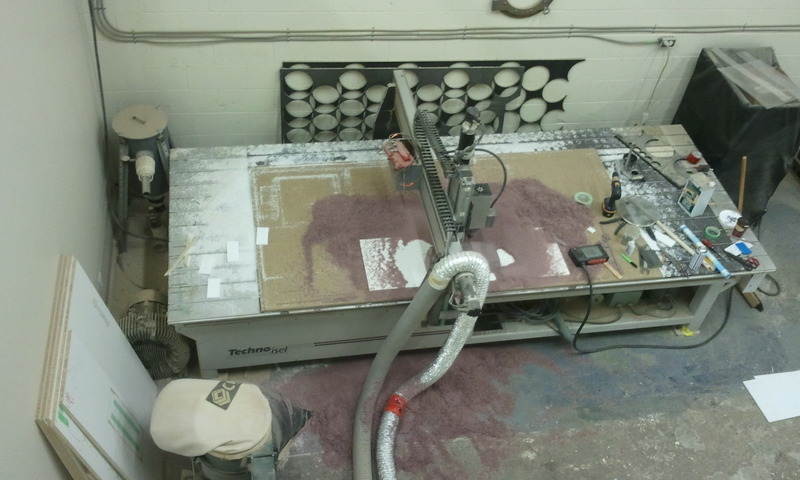 Our poor Techno cnc has been sentenced to the rather large stack of MDF panels that are waiting to be made into various walls and cabinets. Although it hasn't complained about it yet, I suspect it might be bored of 2 dimensional work! 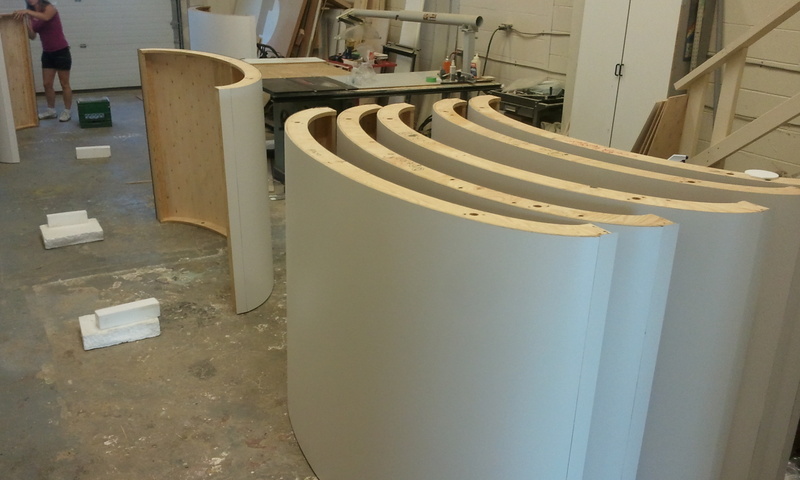 In the centre of the kitchen set, a rather large curved island will reside. This will be for showcasing the different products as they are being used. I do believe its a new line of cookware. the island will consist of 4 sections like the one above. 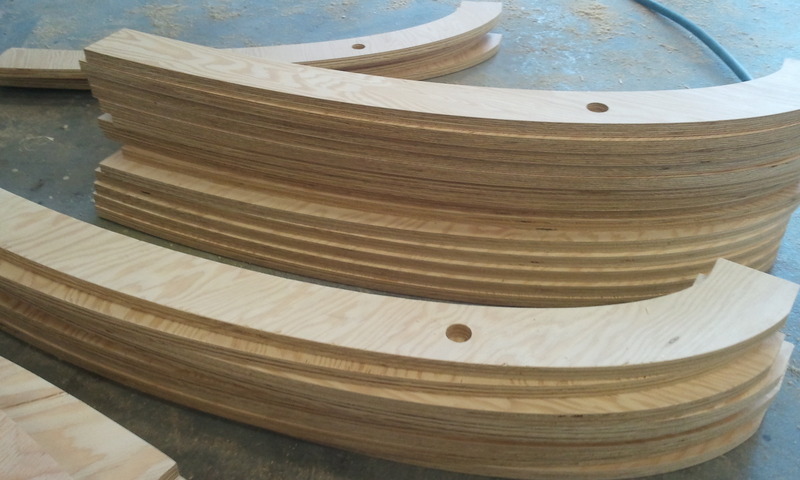 They'll eventually become 2 halves on casters, with the front covered in flexi-ply, for a strong, smooth curve. We have to make 2 island counter tops as well. The first top has 2 cooktops sitting in it, and the second top won't have any, leaving the space clear for product shots. The meeting with Phil the Director and brainchild of the Turbo-town show we're working on went amazingly well. 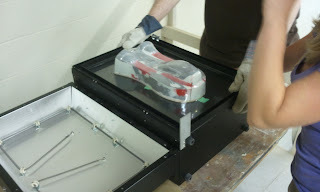 He loved the test vac mold we machined. In fact, he liked our work so much, he asked if we could take over the rest of the vehicles. This is pretty great! I love this stuff! 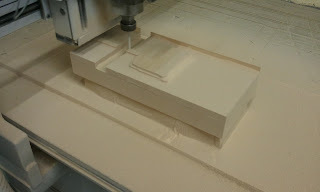 I spent the rest of Tuesday machining the new body from 40lb tooling board. 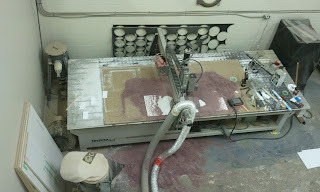 I slowed our Techno cnc down quite a bit as the material is quite dense. Phil had dropped off all of the cars they had, that were ready for bodies to be made. He also dropped of the original prototypes that starred in the test pilot he shot a few years ago. the dump truck, although a little worn now, is such a great little character. When he gets his new face and dump bucket, he'll be hittin' the town lookin' spanky! I also got the wall panels routered for the 7 duplicate garage "homes" the smaller cars live in. I say smaller cars, but the structures are quite large. 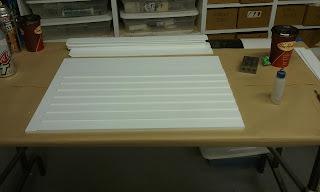 The siding strips are actually 1 5/8" wide! 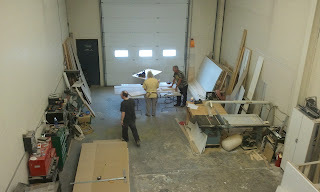 The wall blanks were cut from 1/4" pvc, in fact, most of the buildings will be made from pvc, as they don't want to have to tarp the very large outdoor set. These things will look great by the time they wrap shooting at the end of October. 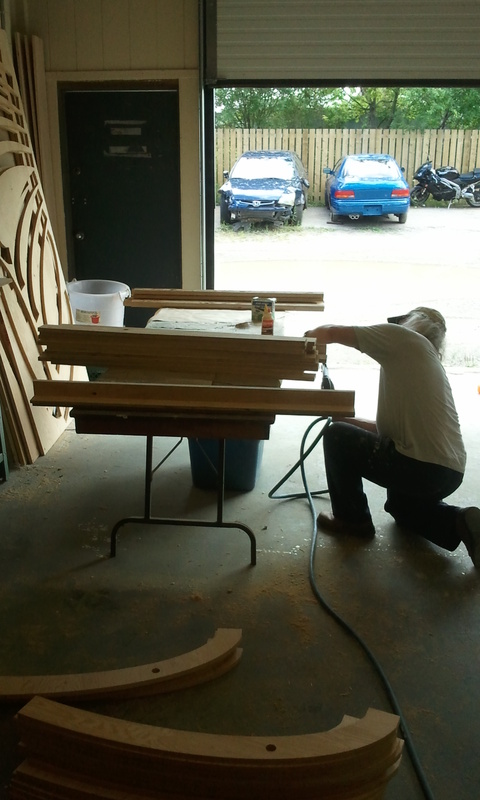 Jody worked quite diligently cutting all the siding strip and getting them all glued up. 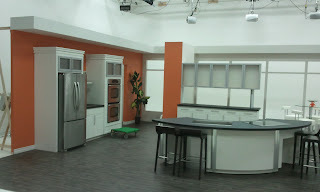 We had a production meeting today in the City for a large kitchen set that shoots the end of next week. So we're going to be building full size stuff for that, as well as miniature stuff for Turbo-Town. At least we wont get the parts all mixed up! We stopped by the production office today after the meeting, and picked up all the resin-cast eyeballs. Were going to be painting all of them as well. Jody got them all scuffed down for paint when we got back to the shop, and I worked on cutting as many miniature window frames and parts as I could, before the big kitchen set stuff has to get cut on the Techno. 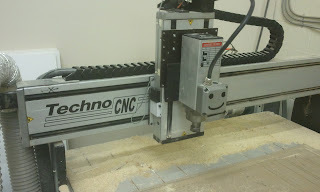 Today I got to run our Techno cnc with the flipped z-axis. It worked beautifully! in fact, it worked so well, I didn't have to re-position the material block I had bolted down yesterday for machining the car body. Setting up the material/ model in Aspire was tricky at first, but it all made sense pretty quick. I machined the first layer at 2" thick. As this is a test mold to see if everything fits properly (as well as a test for me using a different set-up than I'm used to) I wasn't overly concerned on flawless machining. After the first layer was cut(I only ran the finishing pass in one direction to save a bit of time) I glued up the next 2 layers on top. I lied a bit to the router, as well as Aspire, to get the cutter to over-machine the block by 1/4", this was so the seam between the layers would be handled by the machine, not a piece of sandpaper! There's always the thought that things might go very, very wrong, but my math worked out, and so did the part. The roughing pass went pretty quick, even though I slowed the machine down to avoid any possible jitters that could arise. I ended up roughing it at 180 ipm. The great thing about running a test model was that it allowed me to identify any collet/ part collisions. The tips of the headlights had a bit of collet damage from the clearance, but it won't affect the test at all. It does let me know what I have to adjust before I cut into the tooling board. The first pass was cutting while I had dinner at my sisters, but when I got back to the shop, I decided to run a second finishing pass 90 degrees to the first one on the top layer, just to be sure everything was still OK.
We have a meeting with the Director tomorrow, and I'm sure he'll love the new truck form! 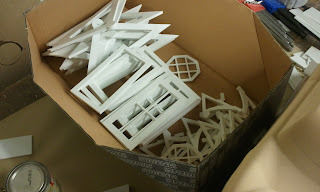 I hope to be cutting the building parts tomorrow, as those need to get put together pretty quickly. 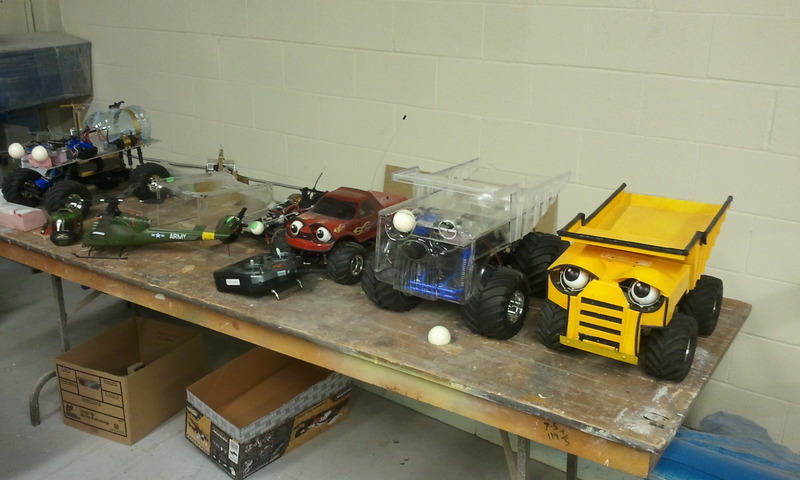 I had great hopes this morning about starting the HDU test plug for the r/c cars. I got everything all ready to cut, but the z-axis on my Techno wasn't able to machine the mold the way I had planned for it to. There was no malfunction or anything, just the limits of cutter/ travel/ etc. I am running an RG series Techno, and it's far from a new machine, that's for sure! It runs the same speeds as the new ones, and runs the same software interface, but it's the old design for the Z-axis. 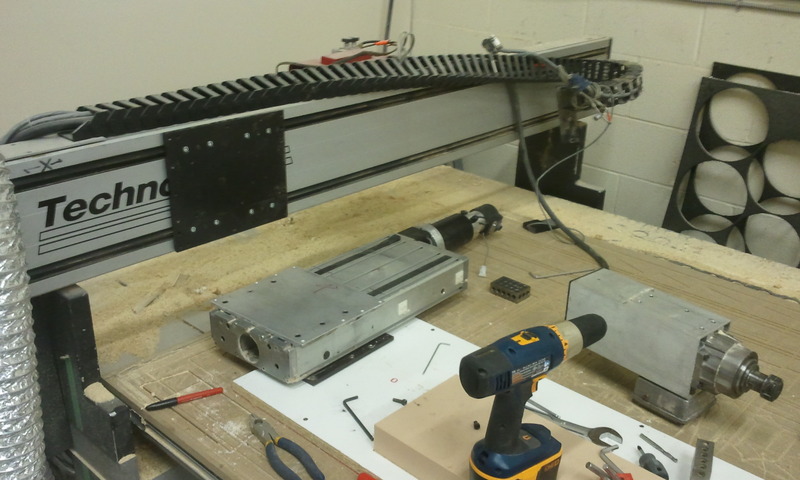 On our RG machine, the whole Z -axis extrusion moves up and down with the spindle fixed to it. I can slide the spindle to different spots vertically, then lock it down, (which is what I have been doing sometimes) but for the truck mold, I don't want to have to re-position anything, which could lead to small offsets on the finished mold. So I though "I bet I can flip that around!" That proved to be more work than I thought. The new Techno's have just the spindle mounted to a plate that rides up and down. BUT.....the neighbor a few units down is a welder, so I thought "maybe, just maybe" he'd have one. He sure did, that and tons more. Good job he was working late! I was back in action! I got the new plate drilled and tapped for the fasteners, and got the whole thing back together again. However, now it was to high from the table at the lowest point of travel. This is easy to solve with a Techno, as most of the extrusions used have C-channels that let everything be fully adjustable. I did have to take it all apart again to adjust it, but at least I didn't have to drill and tap new holes! By 8pm it was all back together.........again. I fired it up and...........the Z-axis movement was now reversed due to the part being on in reverse and the plate moving instead of the whole extrusion. I was a bit panicked that I was now going to face the possibility of re-wiring. Luckily the software interface that makes the Techno so powerful, lets you reverse all the axis by entering either a "+" or a "-" in the scaling section. So once I found the place to do this, I was back in business. Leave it to me to tear apart the most used machine in the shop, in the middle of using it! After a few meetings, and final approvals on some stuff (including posting here) we are slamming head first into a new kids tv show. The shows working title is "Turbo Town" it's basically about a town of remote control cars that have various adventures! The show focuses on problem solving, and "try and try again"
We were able to watch the first test episode they shot, and I LOVE IT! The cars all have animatronic eyes that help express the characters, and make them personable. 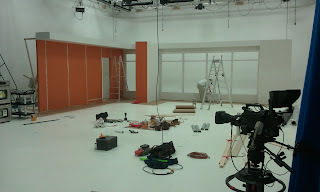 No CG on this show, it's all being done 'in camera', which is a model makers dream come true! We're building all the garage homes for the cars, and painting all the car bodies. The first task was to design all the car logo's, that combined with the individual colours, will help make each character unique, but easily identifiable, while keeping a consistant look throughout. I spent a couple of days designing these up, based on sample images from the director. A few small changes, and they were very happy with them. We're going to get these printed as decals which will be placed on all the cars and trucks. The other part so far is re-making the one mold for the hero character "Rod". The existing mold was hand sculpted, and very well done, but wasn't perfectly symmetrical, as well as having some dimples here and there. In the end, we decided to 3D model a new truck mold for vacuum forming. 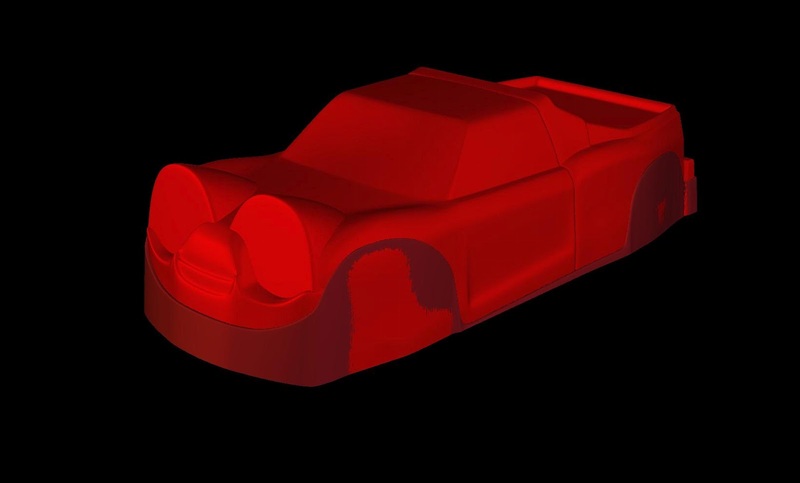 The one I modeled was based VERY closely to the original, with the exception of slightly exaggerated curves. I was afraid to venture to far off the beaten track with it, as it does have to work with the R/C chassis, as well as the animatronic eyeballs. The two giant pop-ups are where the eye-balls will reside. The darker red portion gets trimmed off to allow for wheel movement, etc. 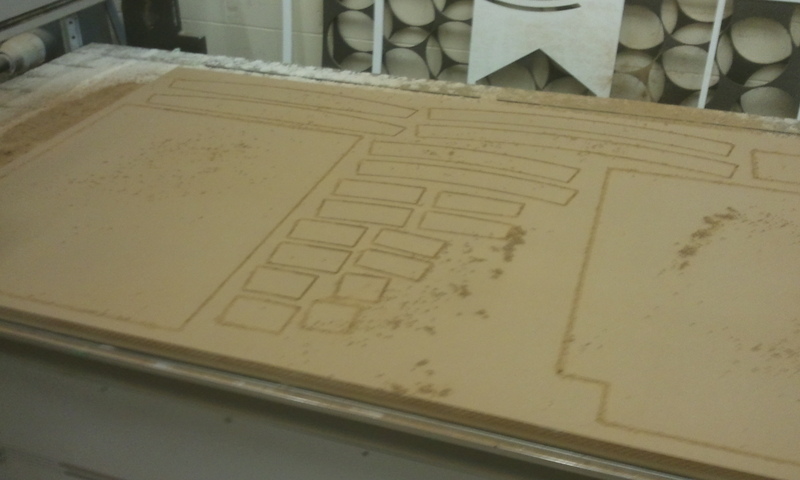 I'm pretty excited to start machining this on our Techno cnc! I'm going to cut a test one out of HDU, this will allow them to vacuum a pull, and test for clearances. Once everything is confirmed, I'm going to re-machine a new one out of 40lb tooling board. 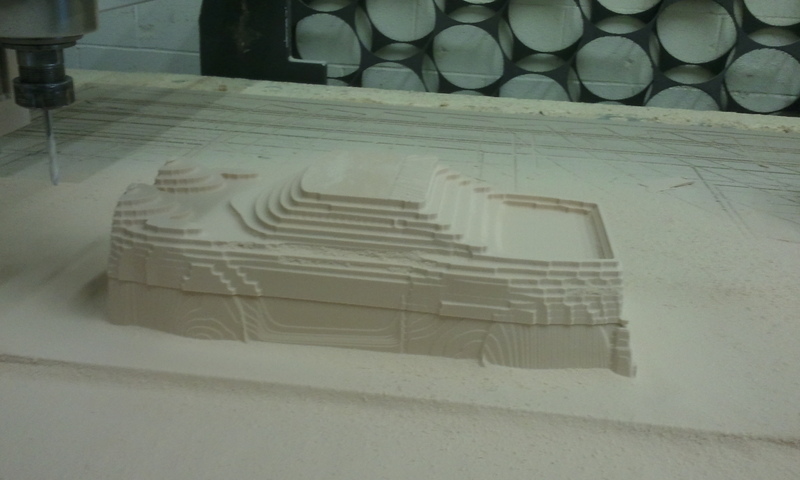 I'll have to slice this model, as I can't cut the full 5" thickness due to tool-length/ collet collision on the part. I've sliced a ton of models for machining before, but I've always glued the layers up after, and cleaned up the seams. I can't do this mold that way, as I don't want any seam-lines creeping in. I want the Techno to do all the work. So I'll have to cut a layer, glue up the next one while the block is still locked down to the machine, and over-machine the seam. This is going to have a little creative Aspire work, but in the end it will rock! Tomorrow I can get to start the HDU test plug, as the Director is coming to the shop on Monday to pick it up. 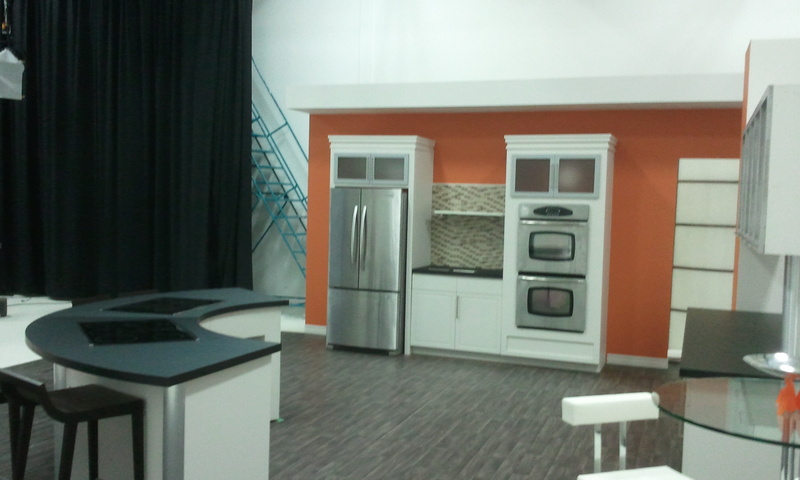 We also have a full size kitchen set that get installed on the 23rd of this month! I hope they get their finals all figured out, as we are starting to run out of time! That seems to be a staple these days....................Good job I'm young!! After being an absent poster, I am here to post the final images for the LG column. This wasn't an overly "awesome' build in terms of cool factor, but it certainly had it's challenges! 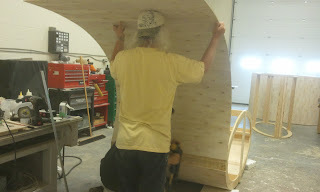 The worst part of the build would have been putting in the removable hatch for access inside the column. I don't know if this column will actually house any lighting equipment, but the last column had a hatch, so this one will too! We used the water-based contact cement for the white laminate. I have slowly built up a dislike for the fumes of the oil based versions! I find that the smell just doesn't go away, even with really good ventilation, and a mask. So in the end, we got the job done early, the delivery wasn't until the 17th of August, but we're makin' way for our stuff! Due to circumstances beyond my control, I was a little late starting today. The joys of being "Da Man" I guess. The plan for today was to get the giant columns skinned in flexi-ply. 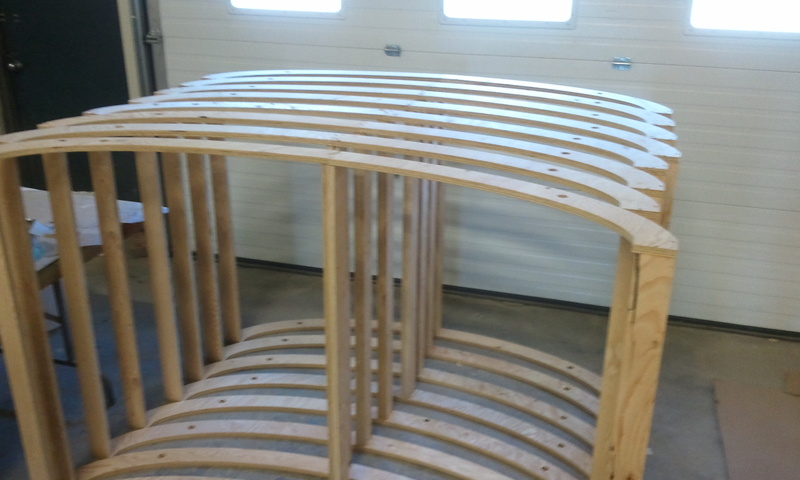 This will be the structure for the matt white laminate we will be contact cementing onto them. 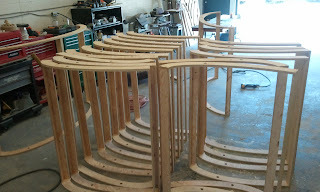 Before we could start the skinning, the frame halves all had to be drilled out and bolted together into a finished oval. 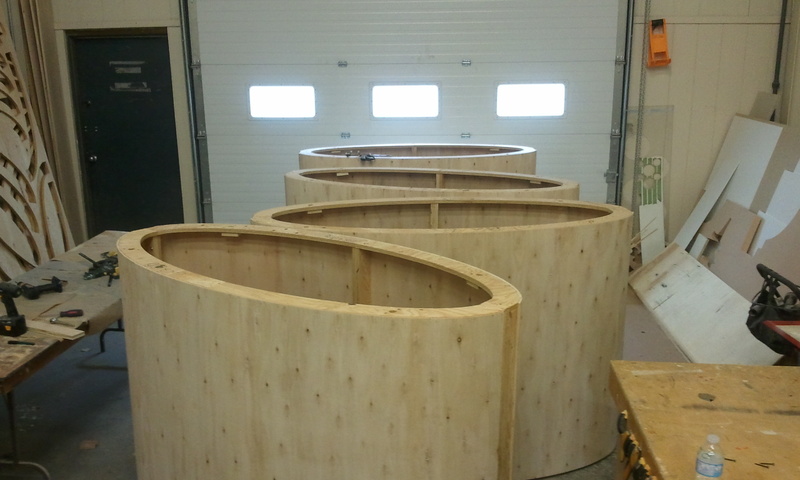 We had to add bracing to the frames to keep them as square as possible while we wrapped them. Once they get wrapped, they are really quite stiff. It was a little awkward to get the material wrapped onto the frames. The radius at the ends of the frame gets pretty tight, causing some foul language to happen at times! It's a little bit funny how every detail from last years build starts to come back to you. The good, the bad and the ugly! 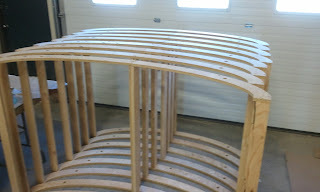 By the end of the day we had all the sections glued up. Phew! We are going to start the laminate on Monday, as we have a pre-pro meeting for a TV show tomorrow. It promises to be pretty cool, so I am totally jazzed to meet with them! Today we started work on this years LG booth. We did the booth for LG last year at Toronto's Fan Fair Expo. It's the Canadian version of Comic Con. The job is actually being split by 3 companies as it's a huge endevour between sound and lighting/ audio visual / Octonorn rentals, etc. 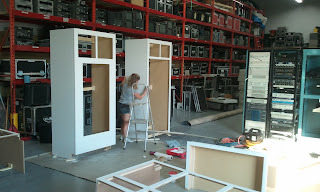 Our involvment is to build a duplicate of the 3'X6'X 20' tall column that houses alot of the tech gear. 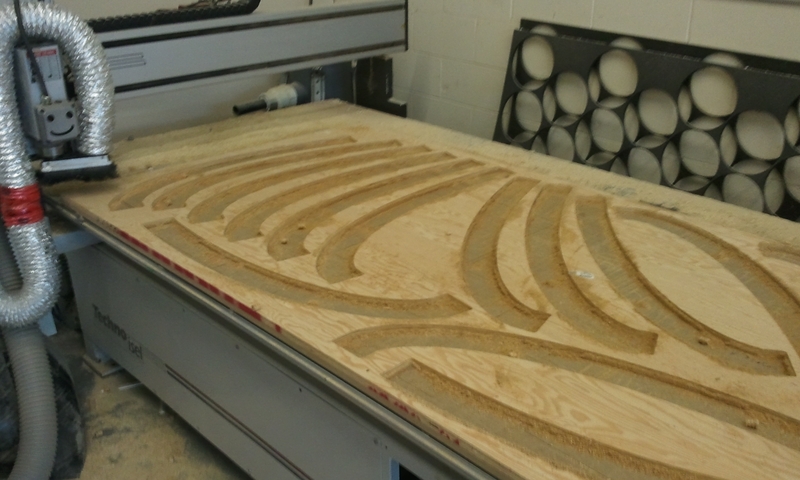 Once again, our Techno cnc was pressed into action. All of the parts were drawn up in Aspire, and toolpathed for 3/4" plywood. The framing is pretty simple to keep the weight down. Weight is a bit of an issue as each section gets raised by the motorized truss system, and the next section gets bolted to the section above it. Then those raise up for the next one to get bolted to. In the end, all 5 sections will be hanging in the air for about 30 min. while everything else gets organized below. I had Andrew in this week to help with these bad boys. 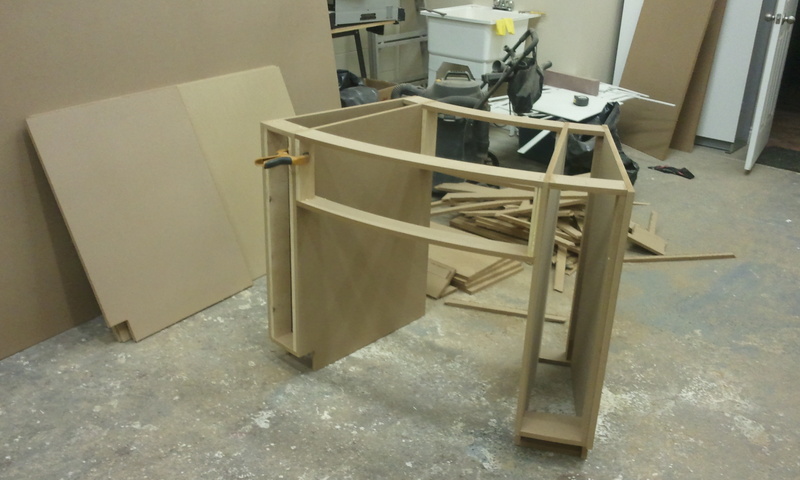 Andrew was head carpenter on a few of last years builds, and this one was no exception. It made sense to have him in again to build the duplicate column. Our Techno cnc didn't take very long to cut all the curved ribbing. In fact, the vertical rib strips were all ripped by the time the router was done cutting the 3 sheets of curved pieces. 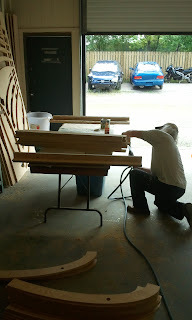 It took both of us to assemble the basic frame structures, as they were pretty flimsy while they were going together. 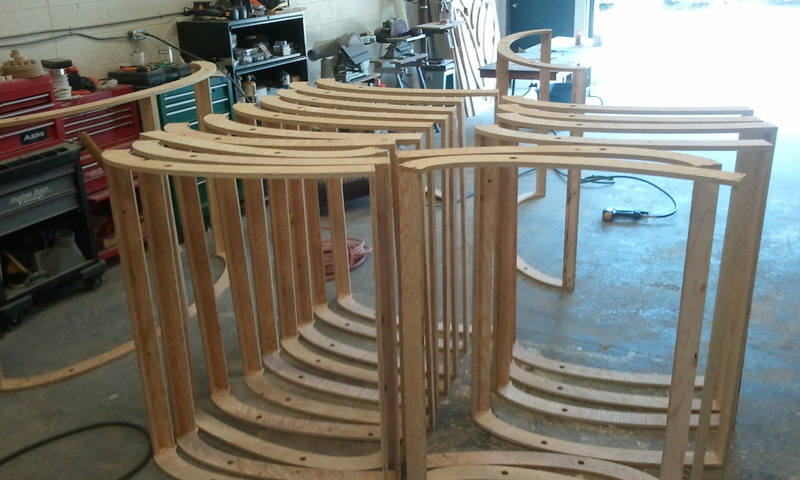 By the end of day, all of the frames were glued and screwed and left overnight to dry-up. 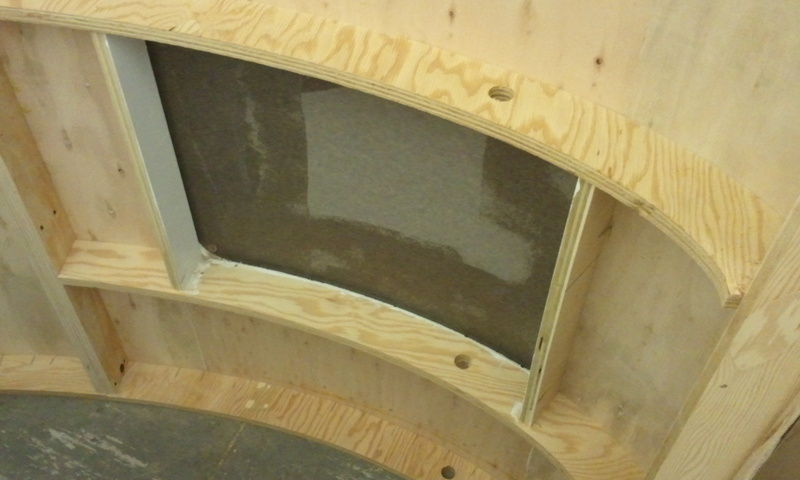 Tomorrow we have to skin these with flexi-ply, then get the white laminate contact cemented on. These aren't due for a bit still, so we don't have to work crazy "movie hours" on this. It was great to work with Andrew again! I'm very fortunate that my work never feels like a "job", it always feels like I'm just hanging out, making cool stuff!